So I received my machine a few days ago. I ordered mine in black, but he has told me that he can do most any color. He also offered me a new version with an adjustable cam. Which I naturally wanted. So I received my machine about a week after ordering, living in Europe it wasn’t far for him to ship it to me. One of the best parts of any purchase of this type is communication. He went above and beyond and sent me pictures of the build along the way. This was a nice touch and I have no idea, if he always does this but his communication was perfect. This is the photo he sent when the build was finished. I received the machine packaged very well, it was in a shipping envelope wrapped in bubble wrap and in its own box. The box also has foam sides, so the machine can’t move at all. Well, enough of that., On to the good stuff. How does it perform? Very well. The over all design is smart and fairly original ( even if it looks derivative of other machines ) . 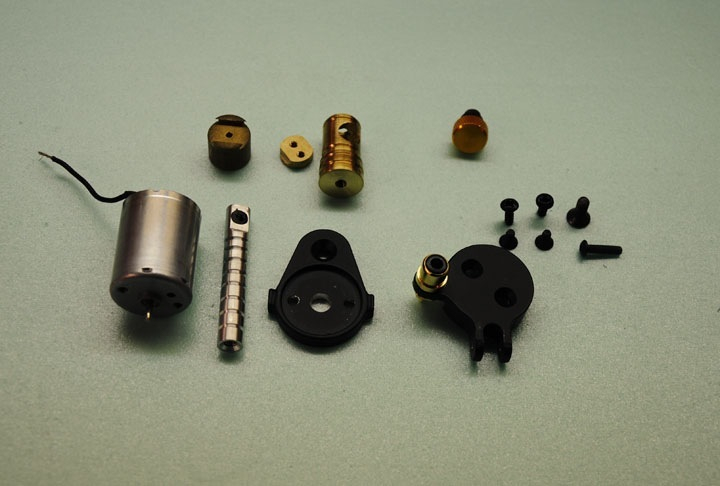 It is lighter and smaller than a brass Rotary Works. If I had to compare it to another machine, I think the original Swiss is the closest mechanically. Although the motor on the Ikarus is a good bit faster, the vibration and sound are about the same. Which means very little sound or vibration. I decided to first try it as a fine liner as the lack of vibration seemed perfect for a 3rl. This is what I miss the most about the NeoTat that I had , and it performed very comparable. It lined perfectly with a 3, and I was able to just relax and tattoo. At no point was I compensating for vibration, or having to over think what I was doing. I often consider that a measure of how good a machine is. If I have to think about the machine while using it, then it might not be for me. For fine lining I was running the machine at about 7.8 volts on a Critical CX-1 G2. The next tattoo I did was filling in background on a chest piece and I used an 11mag and ran the machine a bit faster around 8.8 – 9 volts. Again it was very smooth and I would say that it’s ability for grey wash and color work to be fairly effortless. I also dropped it down to about 7 volts to do a bit of salt and pepper shading, and then back up to around 8 for some color blending. All of this was flawless. The last two tattoos that I did with this machine, I used it as a liner. Both times with a 5rl, and at around 8 volts. For one I was doing some semi-old school roses and wanted to have thicker lines and wanted it to as effortless as possible. So I opened the needle up a bit with a lighter ( still one of my favourite old school tricks ) and made it about the size of a normal 8rl. Now granted I could have just used an 8rl but I am using a machine that I am not 100% used too and wanted the tattoo to be easy on me, and it was. I have always found that no give rotaries line easier with loose needles. The last one was a walk in that wanted a little umbrella on his foot, I drew it in and tattooed it on easily with a normal 5rl. To surmise, I truly believe this is a class act machine. The price I paid was 140€ shipped and that is very reasonable for any machine. He could charge 200€ and I would still think it is worth it. One of the most interesting features of this machine is that the motor ( Mabuchi I believe ) becomes the body, which also air cools the motor very well. I have easily put nearly 10 hours on this machine already and I never noticed it getting warm. As for the adjustable cam, I have not even messed with it. Mine came set at 4mm and for now it will stay there. I love to have the option and may set it around 2.5 for some soft black and grey at some point, but overall 4mm works well for me. The geometry is very good for disposables and I have plenty of room for adjustment even with a lot of needle hang. The thumbscrew on the vice is also very nice and it has a plastic washer so the in no rubbing metal on metal. It is also easy to turn and stays very secure while tattooing. Pros: inexspenive, low vibration, very quiet, and versatile. It is a good all a rounder and good addition for anyone to have. Cons: it is slightly heavier than say a dragonfly or a Rapier II. The washer that holds the crank arm in place on the A-bar is moved out of alignment, the machine will start to make some noise. I found out when I was switching out the stock grommet for silicone tubing. Pops rubber bands almost as often as my Rotary Works does. All in all, I like the machine a lot. Is it a perfect liner, maybe not but it is a good liner. A little give and it could be a great liner. As for a shader it’s great and I handily believe it can push larger mags too. The amount of power it has is impressive and it was very hard to bog down the motor at all. Ok, hope that helps and isn’t too long winded. If you want to find him, he is on Facebook as Ikarus Rotary and the price is 180$ to the Americas or 140€ to Europe. I am in no way affiliated with Ikarus, just a very happy customer. I am more than happy to answer any questions. 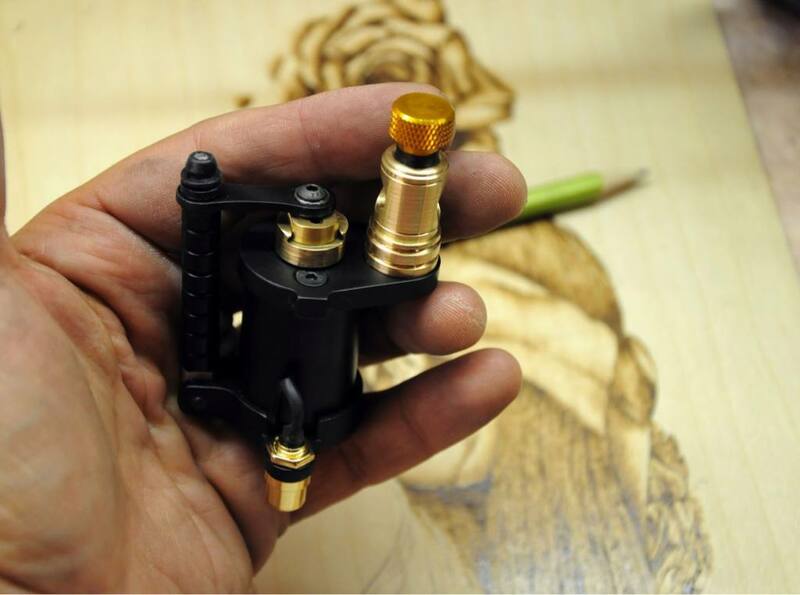 Todays review is about an incredible tattoo machine that I recently bought. Now…in my iPhone I have a ‘note’ with a loooong list of machine builders that I’ve come across during my time as a tattoo artist. I hope to eventually add a little ‘check’ icon next to each name on this ever growing list of mine. So far I’ve checked off 3 of 20. I have some way to go. Opening a little cardboard box with a brand new tattoo machine inside mailed directly from a tattoo artist that is an inspiration to you and your work encourages feelings that are indescribable. 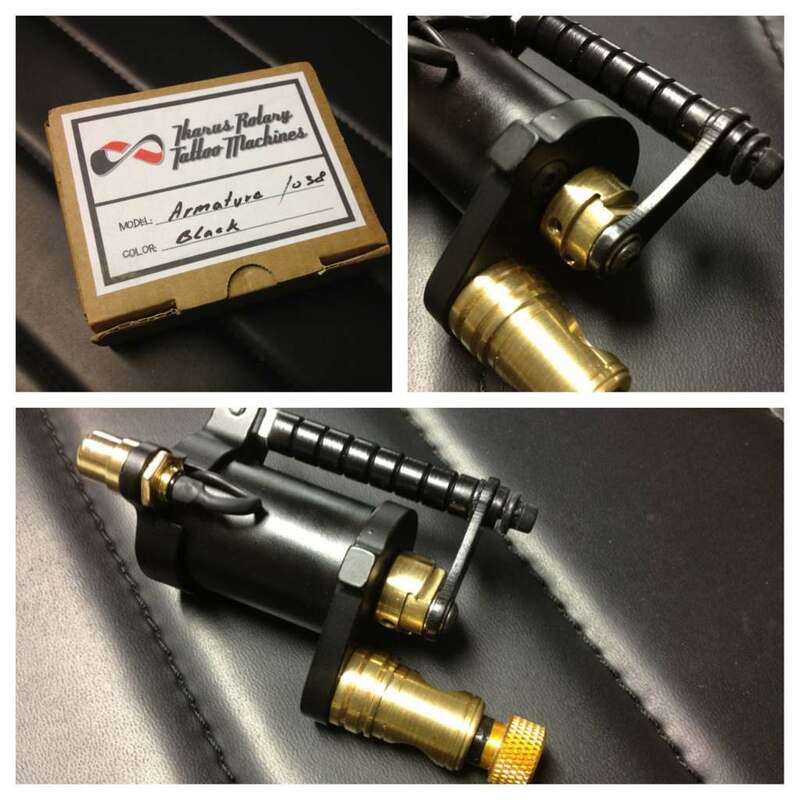 For me anyway…I don’t get much excitement in my life, I love receiving new tattoo equipment in the mail. I feel like a kid on Christmas morning. I was extremely excited to use my new purchase. Within the first couple of tattoos that I had done with my new Norm machine I knew that I had made the right decision. I was actually surprised at how well the machine packed in such a solid outline. I had used a couple of machines in the past for bigger outliners but none would come close to comparing to my new Norm machine. I had a Dan Folwer Time Machine which was ok, and a Paco Rollins’ machine that for some reason would never allow me to get a solid outline in. The new Norm machine literally is like tattooing with a Sharpie. It runs super smooth and puts in a solid line every time. Im not putting down the other 2 machines, they just didn’t seem to work for me. I felt like I would almost always have some empty spots in the outline that I would have to go back and hit again. One thing I noticed right away about the Norm machine, which I had never seen on any other machine I owned or used, is that instead of one front and one rear spring, Norm just used one solid spring. I don’t know much about machine building or tuning, so I don’t know what kind of advantage this gives to the machine other than maybe it offers a more solid hit because there is no break in the spring? Im not sure, but as I said, it definitely caught my eye. Norms creative style of tattooing definitely carries into his machine building. I always see tattoo machines as little sculptures and Norm’s machines are definitely that. That point is what also makes machines so fun to collect. Each builder has their own creative style and mojo that makes their machines unique. The machine that I got has a simple frame design but also has his signature Louis Vuitton coil covers which I love. All in all its a great machine, it looks awesome, its light weight and comfortable and most importantly packs in super solid lines. I can honestly say I will be buying more of Norm’s tattoo machines and would definitely recommend them to everyone. But I also think you should all make a little ‘note’ in your phone or spiral notebook if you’re old school and make a little list and experiment with all of the equipment you can!! Theres so many great builders out there its hard to try them all. I’d love to hear some machine recommendations from you guys!! Check out Norm’s website and check out one of his machines for yourself!! !